Celebrate the very best of Filipino culture, food and tradition at the inaugural Fiesta Pinoy, hosted by the BOP Philippines Friendship Society Inc.
With food stalls, traditional decorations and live performances, the Rotorua city centre will come alive with the sights, smells and sounds of the Philippines. Be captivated by local performers who will stage a range of cultural songs and dances, incorporating both traditional and modern music, all in authentic costume. Performers include Olein Ona (Miss Philippines NZ 2014), Chris Manulunas (member of the Royal NZ Ballet) and Fely Aragon (composer and Fiesta Pinoy musical director). Famed Filipino choreographer Mynard Maghari has put together all the dances as well as the programme which features three hours of free entertainment. Taste the delights of traditional Philippine cuisine including popular meat dishes such as tocino and longganisa, pancit (noodles) and Filipino cake and sweets. Share in the spirit of Filipino hospitality and don’t miss this fantastic evening of culture and colour. 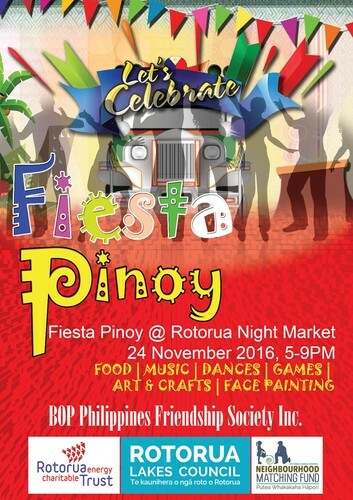 Fiesta Pinoy is supported by the Rotorua Energy Charitable Trust, Rotorua Lakes Council and the Neighbourhood Matching Fund.